Winrock International » Tower Power! Telavi’s “Energy Central” combines renewable energy approaches to reduce carbon emissions. In Georgia’s Kakheti province, the city of Telavi is an administrative hub – so it’s no surprise that it’s also become a forward-thinking innovation center. 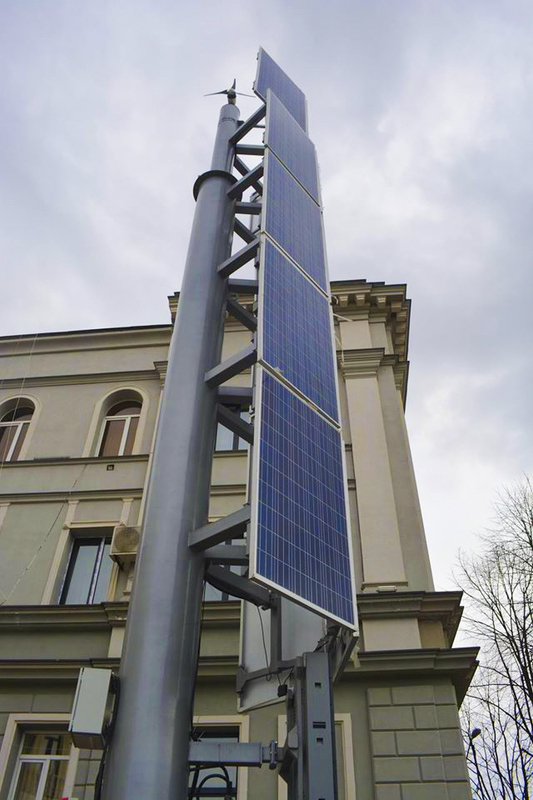 Telavi recently unveiled Energy Central, an energy tower that provides electricity and heat for Telavi City Hall. Financed by USAID’s Enhancing Capacity for Low Emission Development Strategies (EC-LEDS) Clean Energy Program, implemented by Winrock and other partners, Energy Central is a crucial step toward the city’s goal of reducing CO2 emissions 20 percent by the year 2020. The Energy Central tower combines several mechanisms for capturing renewable energy — including solar photovoltaic panels, a horizontal wind turbine, and a heat pump — as well as a monitoring system that will accumulate data on energy consumption and help reduce utility costs. Energy Central is the centerpiece of Telavi’s Green Recreation Zone, a public garden that reduces the city’s carbon footprint and provides citizens with a tangible connection to the town’s climate-control efforts. Local broadcast and print media were on hand there in January when USAID/Georgia Mission Director Douglas Ball, Telavi Mayor Platon Kalmakhelidze and other officials from USAID/Georgia and the Georgian National Energy and Water Supply Regulatory Commission participated in the unveiling. That’s the hope of EC-LEDS, as well. Energy Central was a pilot project — a small-scale preliminary model designed to test a project’s feasibility, time and cost. Other municipalities may be able to build even more energy-efficient power stations on a larger scale. Reducing emissions, saving costs and paving the way for new innovations: that’s real tower power.